Watford are placed 4th in the league with 73 points, and have a goalscore of 80:48 so far, while Middlesbrough are placed 1st in the league with 75 points, and a goalscore of 60:30. This is a match either team have to go for the three points in, which should give us some great chances for a good match here. 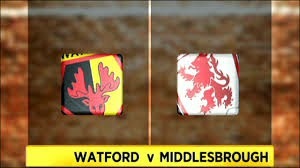 Watford have played 8 of their last 11 matches over 2.5 goals, while Middlesbrough have played 4 of their last 6 matches over 2.5 goals. Four of their last six meetings have ended with three goals, and I expect the same thing to happen here.